The Raving Bike Fiend had offered me this bike some time ago, knowing that I have a soft spot for loop frames, the ability to properly fix it up, and that my own vintage CCM, Poplar, was in extremely poor condition and I was spending more time fixing it than riding it. But with both of us living car free, transporting a non-functional bike cross town can get a little complicated. 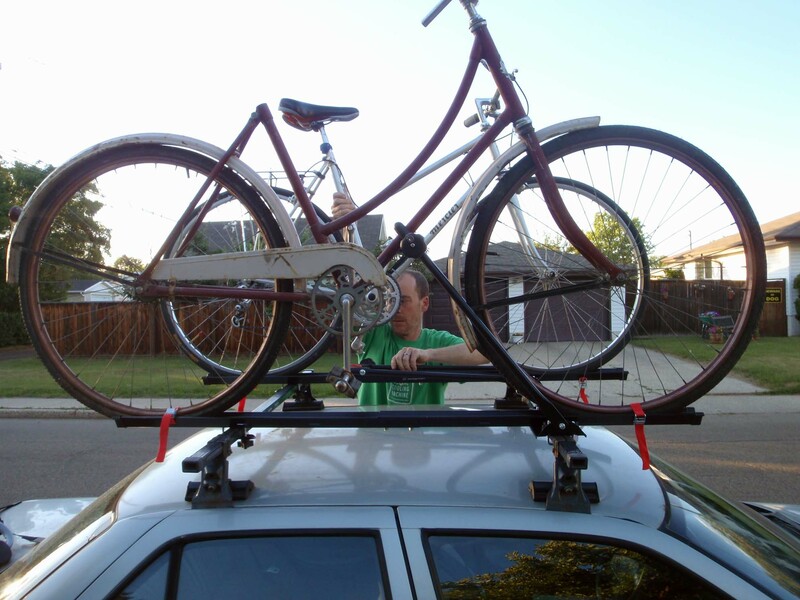 With a big trip on the horizon, though, he got his car rolling again and outfitted it with the necessities: racks for multiple bikes. Keith loads up the ’46 CCM and le Mercier beside it to get me & my bikes home. This would be the first time in months that I’d stepped into an automobile. 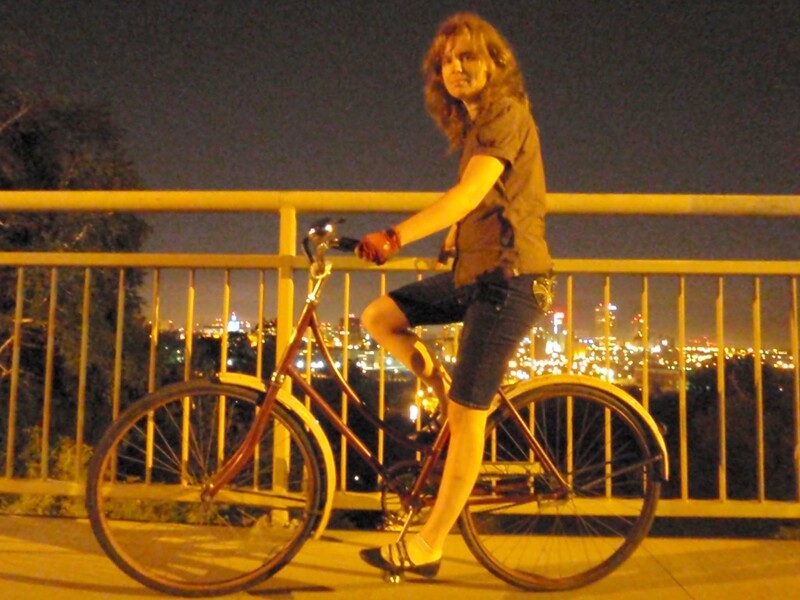 The bike was given to Keith by another BikeWorks volunteer, whose grandmother was the original owner. In remarkably good shape, the burgundy rims still had their original white pinstriping, though the striping on the frame hasn’t fared as well over the decades and the white paint on the chain guard and fenders was particularly rough. It was missing a pedal, chain, grips, saddle and seatpost but still had all its integral components. However, the important question was how it looked on the inside. The first step was to replace the missing components and get it ready for a test ride. 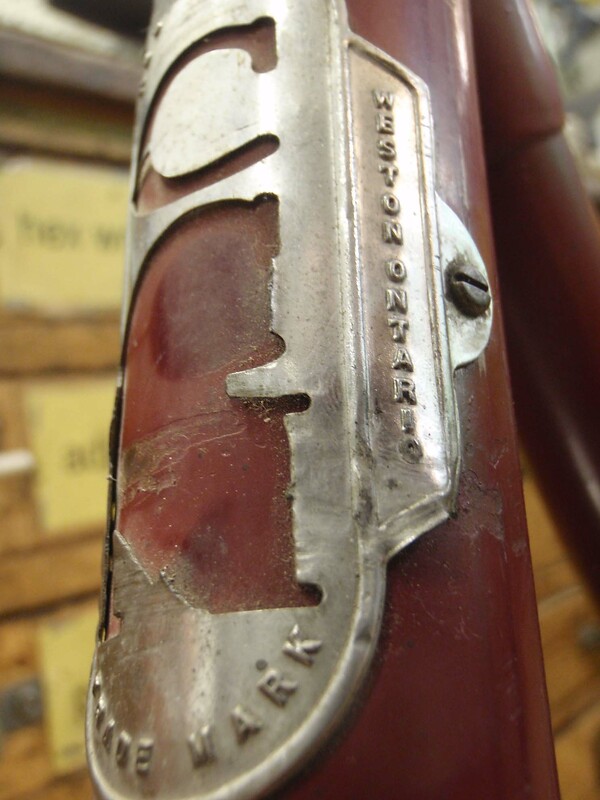 Keith gave me a new old stock CCM seat post and I lucked out tremendously and found a Wrights leather saddle (history note – Wrights was an English manufacturer that was bought out by Brooks in 1962). With a brand new 1/8″ chain, it was starting to look like a whole bicycle again but started getting complicated when I went to install pedals. I had found an appropriate set of 1/2″ pedals and had them ready to go when, after much grunting, swearing and penetrating lube to get the old one off, surprise! 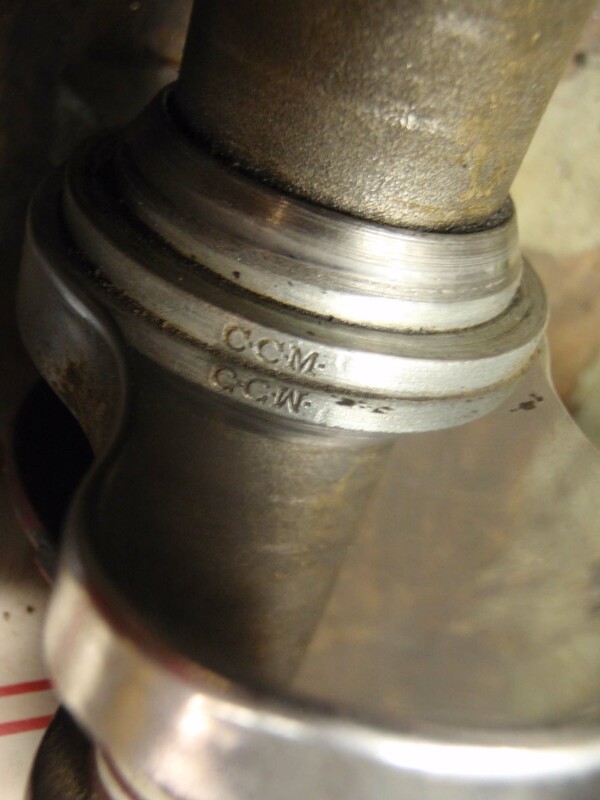 I discovered one side of the 1 piece crank was drilled 1/2″ and the other side was drilled 9/16″. WTH? Why would anybody do that? Did they start on the right side before realizing the left side was reverse threaded and needed a special tap? Disappointed that I wouldn’t be able to use the awesome pedals, I headed to the parts room to see if, by some major minor miracle, I could find a matched pair of mismatched pedals. Luck was on my side again, and you wouldn’t know they weren’t a pair by looking at them. Keith had mentioned some concerns about the coaster hub, so I started the overhauls with that. Old CCM coaster hubs are fairly different than any other coaster hubs I’ve worked on, so if any of the parts were worn, finding spares would be an issue. Though very grimy on the outside, I was pleasantly surprised to find pretty clean lube and all the parts in excellent condition when I opened it up. When I tell people that hubs can outlast bikes if they’re taken care of properly, this is exactly what I’m talking about. 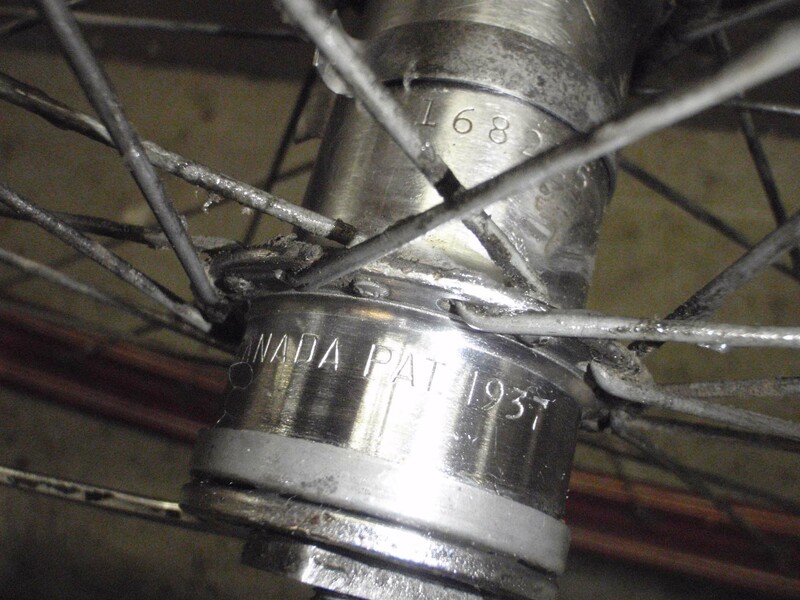 This 66 year old hub was in better condition than a lot of 2 year old hubs I’ve seen. A large part of a project like this is cleaning. 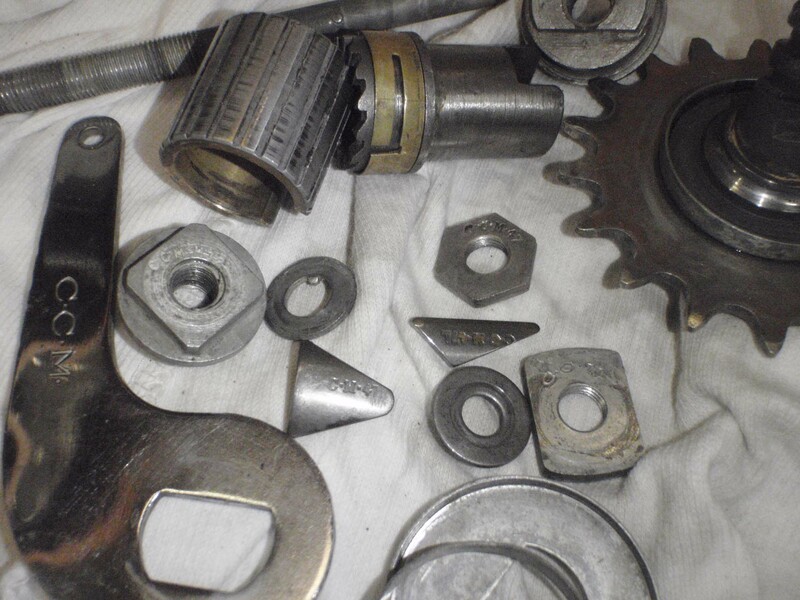 There’s a nice cog under all that caked on grime, waiting to be exposed with degreaser and some elbow grease. The parts of the coaster hub before reassembly. If you look carefully, you’ll see that every part, even the nuts, are stamped “CCM.” I don’t know why, but it makes my heart skip a beat in joy. Reassembled and shined up CCM coaster hub. Made in Canada, patented 1937. My next priority was to repack the headset, which felt a little loose. No surprise that the stem was corroded in place inside the steerer tube, but after much grunting, swearing and malleting, I got it out. The wedge part actually had rustcicles growing from it! I disassembled the headset and set the fork aside to clean the cups when I heard the sound of running water. 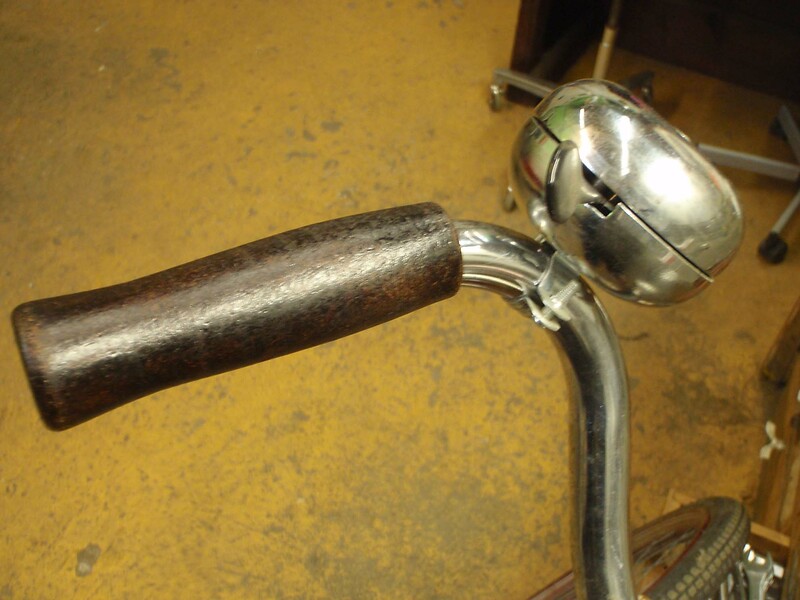 It turned out the steering column on the fork was full of water, which was now running across the bench and onto the floor. At least that explained the rustcicles. Despite the watery surprise on the inside, the races, cups and chrome were in beautiful shape underneath the grime. Also, this is by far the best photo of anything I have ever taken inside BikeWorks. The headset itself was in fine shape, and I didn’t have any other issues repacking it. 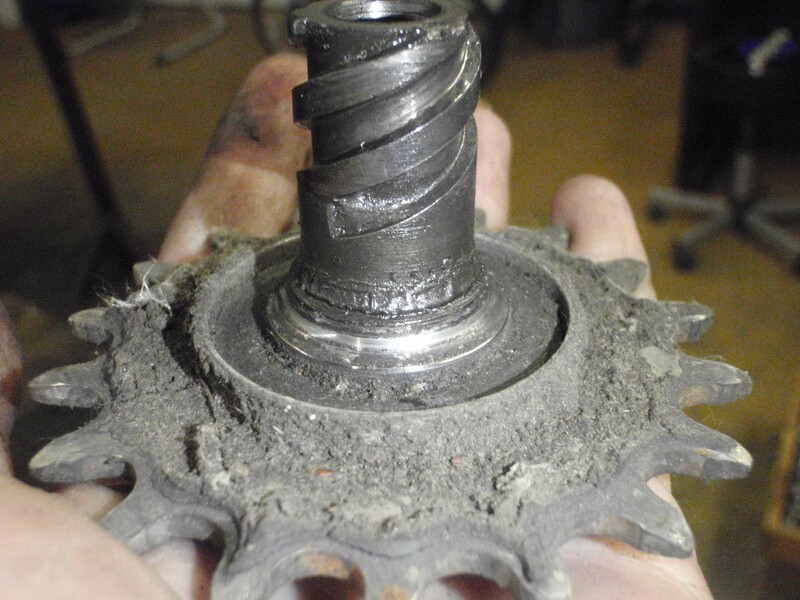 While I had the front wheel off, I repacked the bearings in it too, and like the back, it looked like it had been maintained regularly and would see many more decades of use. The headbadge has seen better days, my guess is because of a basket. Notice how the paint is unevenly faded where parts of the badge have chipped away. After all of that was reassembled, I could finally put on my grips. I wanted something special that would still be appropriate to the bike while fitting within my next to nothing budget and vegan values. I decided to go with cork stained to match the saddle, as described in Lovely Bicycle and in the subsequent comments. Two light coats of all in one Minwax stain/sealer on plain light beige cork. I then used a layer of double sided tape to keep the grips in place. The last major thing to do was the bottom bracket. After finding all that water in the steerer tube, I was really worried about what awaited me in the bottom bracket, especially considering the bike had been sitting outside with an open seat tube for an indeterminate amount of time. Bugs, leaves, sand were some of the things I expected, but all I found was enamel that had chipped off of the inside of the bottom bracket shell. There was a very small amount of pitting starting on the races, but it should be OK with diligent maintenance to keep it from getting worse. The last step was take it for a late night test ride! 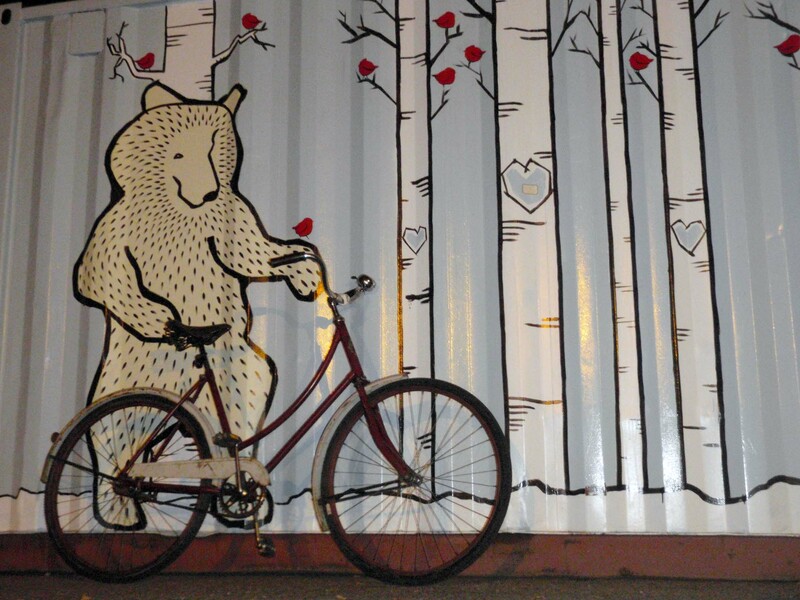 The wolf was also excited about this old school bike and wanted to take it for a test ride too. All these repairs took several nights, and I had been riding the bike back & forth to the shop without grips & overhauls, but that first guilt-free ride when you know you’re not pushing your luck by getting on an unfinished bike is something special. The bike is heavy and clunky, and I think I may need to look at the coaster brake again because it occasionally makes an unhappy noise, and the saddle squeaks like crazy, but it’s still a joy to ride. Upright, lady like and attention getting, the bike turns heads and I’ve gotten many compliments on it from random strangers. Because the frame isn’t bent, it handles much better than Poplar, and the gear ratio feels just right. The tires are in fair condition, but I know I’ll have to be on the lookout for appropriate replacements. The wheels could also do with a truing, which I’ll do when I replace the tires. I don’t care how late it is, I need to test ride this baby. I fix enough bikes to know that some are more satisfying than others. This one was off the scale. I’m sure at least one of you wants to know if and what I’ll name this bike. For something that’s survived so well intact and potentially still has a long life ahead of it, it feels kind of presumptuous to give it a quirky moniker. But as I reread this post, an underlying theme of luck comes up, so I think I may use that as inspiration for a name. Oooh, very nice! It’s extra special to give a bike like that a new life. The wolf pic is great. Nice to see another CCM loop frame on the road again. Can’t wait to get at my 1939 CCM loop frame and take pictures like you of it. Good work! Great read! Was wondering if I might have permission to reprint it on my website – http://www.vintageccm.com. Thanks. Will post a link for sure. Sweet bike! I found a 1948 men’s coaster and am rebuilding it right now. Wondering if I could get some help with the brake rebuild? Put alot of kilometers on my 1947 mens CCM this year, rode it 1 Dec before the snow arrived. My 1948 loop frame is outside waiting untill I find 28 inch rims to replace the perforated chrome ones on the bike. Anyone have some spares? Babac actually sells replacement rims for quite cheap if you’re up for a wheel build. Do you happen to have more pics of the disassembly / reassembly of the coaster brake ? I’m currently servicing one and would like to compare ! My 1948 CCM loop frame is now back on the pathways of Calgary. Took it out 20 March for a good test drive. Smoth riding. No painting just a lot of cleaning grease, automotive polish and wax. Shows its age but I do also.